Los Angeles County covers 4,000 square miles, with a population of 9.5 million individuals, with an anticipated growth to 11.5 million by 2020. The unincorporated areas include more than 2,600 square miles and represent two-thirds of the County’s land and one-tenth of its population unofficially grouped into 139 areas. Some of these unincorporated areas are as small as a few blocks of unincorporated land surrounded by cities. Others are urban centers with more than 150,000 residents. Yet others cover hundreds of square miles with sparse populations in the high desert. If a city, these unincorporated areas would be the third largest in the State, after Los Angeles and San Diego. They are diverse in terms of their socio-economic levels, encompassing some of the County’s wealthiest neighborhoods as well as communities with concentrations of individuals and families requiring financial assistance. Los Angeles County is geographically one of the largest counties in the nation with approximately 4,083 square miles. The County stretches along 75 miles of the Pacific Coast of Southern California, and is bordered to the east by Orange and San Bernardino Counties, to the north by Kern County, and to the west by Ventura County. Los Angeles County also includes the offshore islands of Santa Catalina and San Clemente. 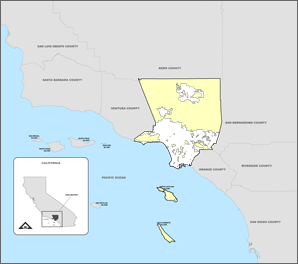 Los Angeles County is divided in to five (5) supervisorial districts. The Los Angeles County Board of Supervisors, created by the state Legislature in 1852, is the governing body for the County. Five supervisors are elected to four-year terms by voters within their respective districts. The Board has executive, legislative, and quasi-judicial roles. It appoints all department heads other than the assessor, district attorney, and sheriff, which are also elected positions. Los Angeles County covers 4,000 square miles and is home to a population of 9.5 million individuals, which is anticipated to grow to 11.5 million by 2020. The unincorporated areas include more than 2,600 square miles and represent two-thirds of the County’s land and one-tenth of its population unofficially grouped into 139 areas. Some of these unincorporated areas are as small as a few blocks, some are urban centers with more than 150,000 residents, and some cover hundreds of square miles with sparse populations in the high desert. If they comprised a single city, the unincorporated areas would be the third largest in the State, after Los Angeles and San Diego. The unincorporated areas are diverse both socially and economically. Regional Planning started in Los Angeles County in 1922 with the establishment of the Regional Planning Commission (RPC), a body that still exists and is responsible for advising the Board of Supervisors on all planning matters. It is the oldest planning body in the United States. The roots of the Department of Regional Planning (DRP) lay in providing staff advice and assistance to the Regional Planning Commission. It became an independent Department in 1974 and continues to support the Commission and Board of Supervisors. To fulfill its responsibilities, the RPC formulates policies and conducts regular public hearings weekly. Tentative subdivision tracts, zoning changes, variances and permits, Countywide and Community plan polices are presented to and acted upon by the Commission. DRP designs long range plans and prepares ordinances for approval by the RPC on subjects such as ecological areas, senior citizen housing, parking, etc. In addition, the department prepares and develops amendments to the County of Los Angeles General Plan, a two part document that covers 1) countywide chapters on elements such as land use, circulation, conservation and open space, housing, safety, and noise and CSD’s, and 2) community specific plans for unincorporated areas. DRP also provides Hearing Officers to review cases of limited complexity, allowing the RPC to devote more of its time to the consideration of more far-reaching policy issues. The hearing officers are appointed by the Director of Planning from experienced staff members, and are subject to approval by the Board of Supervisors. The Hearing Officers hold regular hearings on discretionary, non-legislative development cases. Their decisions are subject to appeal to the RPC. In addition to these functions, DRP handles inspection, and code enforcement. DRP is responsible for both providing immediate responses to enforcement and permitting requests, and considering long-range development issues. Therefore, DRP must consider a broad range of constituents, from individual homeowners, to large land owners, to community groups, to future generations of Los Angeles County residents. DRP outreach efforts to all affected groups have been a hallmark of its operations since its establishment.